The City of Grand Prairie, Texas, operates an annual backflow testing and prevention program as required by state and federal law in order to assure that the water distribution system in Grand Prairie is unspoiled, thus guaranteeing the health and welfare of its citizens. All backflow testing companies must register with the Environmental Services Department in Grand Prairie and must meet all requirements of that department. 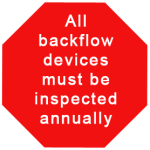 Environmental Services conduct the initial backflow testing of any backflow device installed. After that, once each year all backflow preventers must be tested by the city. City Backflow Testing is licenses and registered with the City of Grand Prairie and with many other cities in the Dallas area.